Hola! Being a art addict I signed myself up to a art trip to London, thinking it will be nice to look around the art galleries, taking inspiration and staring at them for a hour or so in oar. When we arrived I thought I had go on to the wrong coach, we turned up in the centre of London in a court yard. Only till you got in did you realise the amount of effort gone in to each piece of graffiti around the yard. This wasn't any old graffiti this was hand painted. We toured around London looking at every single piece of Street art we could see. The paintings were amazing and very intelligent too, behind each piece was a story, even if it didn't make sense to anyone else, which I think is very important when you are doing art, there has to be a story behind your work, and it won't make sense to others. People interpret differently to others. We did draw some of the art we saw and my absolute favorite was the "Chewing Gum" art work. This is where the intelligence comes in. This is a artist who's canvas is chewing gum, he paints on the chewing gum the scenery he can see, as he's fantastic. But you have to have a good eye to spot it. It's Uniqueity makes it so good, if you want to be a good artist, I think it's important to stand out and do something different. My other favorite were the stick man graffiti, the artist had painted just plane simple stick men, but each one's expressions were different and you could easily tell what there mood's were by just there body expression, nothing else. 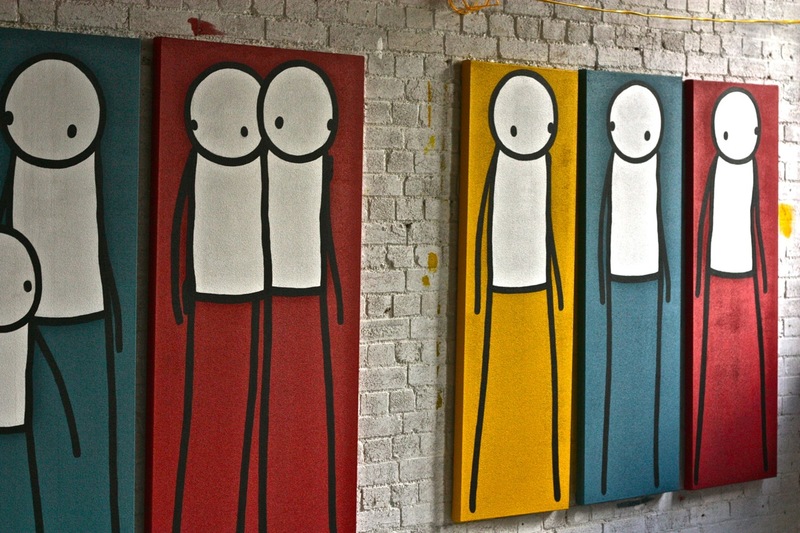 These were my favorites because they are so clever and unique and yet if you showed me a picture of a stick man I wouldn't class it as art. If you follow me I will be sure to check out your blog and follow it back! Thanks so much! Tangle Teezer Review: Are they reliable? Hello again! I thought reviewing the tangle teezer would be a good idea, as they seem almost too good to be true? They have become very big and been recommend by loads of fashion/beauty/hair guru's, but my review will be better. Promise. As a young girl, having long hair, tangles were a common issue with me, I couldn't care for my own hair and usually my parents had better things to do then brush my hair every second. So when the tangle teaser came out, it was literally the only thing I wanted in life, almost as if I would jump off a cliff to get it (Yes, just for a hair brush) At the time it was £10, so not something you would want to spend money on if it wasn't going to work. The tangle teezer looks like something you'd brush your horse with it is very small, but that's perfect for chucking into a hand-bag and fits comfortably in the palm of your hand. The reason why the tangle teaser works is because the teeth or bristles are short and are different lengths, this means it does not tug on your hair and your hair will not get caught as it can just slide out. I use mine everyday and have done since they first ever came out, I think it is probably the best hair product I have ever bought and is worth the money. The bristles are made out of plastic, and are very flexible however this does mean that after using alot they tend to bend alot, I still don't think this effects the overall result though. On really knotty hair days I do use some detangler called Twisted Sister Urban Therapy Which not only works amazingly it also smells nice, and let's be fair, smell is a key. Tangle Teezers come in so many different colours, which I think makes it extra cute and pretty! I hope that you enjoyed this and it helped you somewhat, you can get tangle teezer's from any local drug store, e.g. Boots etc. Please follow me on twitter, link at the top of the page, instagram and add me on google+ ALSO FOLLOW ME! On Bloglovin' and the google thing. Thank you so much! Painting with Acrylic's- How to do an easy, pretty painting! I used my finger to do the white blobs, as it was much easier to do than with a paint brush, the blobs may not look good now, but it is a crucial part of the finished picture. At this point I kind of went mad with the paint, flicking different colours of paint over it with my paintbrush, however this actually does make it look really nice and I could see the the paintings of meadows on the internet had flicks of paint on too. I really enjoyed painting it too because it was really easy and if you went wrong, it would add to the picture and make it look nice! That's a bonus by far! I began to make the flowers more...flower like, on every white blob I added a different colour and decorated it delicately. 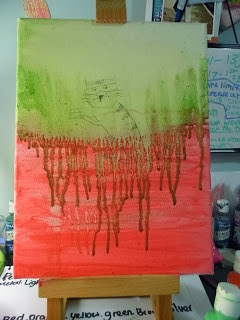 I also began to added more shades of grass and more to the sky. I didn't seem to noticed that while I had been happily flick paint all over the picture, I had actually been happily flicking it all over the wall too! I could've hidden it but unfortunately pink, purple, blue and yellow paint doesn't cover up well against a blue wall! Hopefully it would all be worth it though if I was to create a masterpiece! Thanks for reading!!!! I would absolutely love it if you tried this out and tagged me in a photo of it!!! Instagram- @_hanbanana or on google+! Please also, if you enjoy my posts, follow me on bloglovin'! Have a beautimous day!